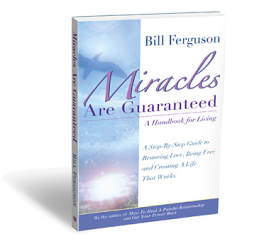 ﻿ Miracles Are Guaranteed, a book by Bill Ferguson – Divorce As Friends You can create a life of miracles. This may seem impossible, but it’s not. You can create a life of miracles. This may seem impossible, but it’s not. This is actually the natural state. You lived this way when you were a young child, but lost it in the process of growing up. Now you can get it back. You can set yourself free inside and have your life be the exciting adventure it once was. You do this by creating something called the experience of love. When this is present, you are happy, alive and free. You feel good about yourself and good about your life. You are confident, creative, and very effective. You see life clearly and know what needs to be done. You also radiate a very positive energy. Life works wonderfully and great things happen around you. This is the experience of love. When you live in this state, miracles are guaranteed. This life-changing book shows, step-by-step, how to create and maintain this state. It is possible to create an incredible life, but this won’t happen by itself. There are concepts to learn, issues to heal, and action to take. This book will walk you through the steps. the Nook, iTunes and most major bookselling sites.